This illustration shows what might happen when matter and antimatter annihilate each other. Nuclear scientists in Switzerland recently dropped some antimatter. The world didn't blow up, but there were some tiny explosions. 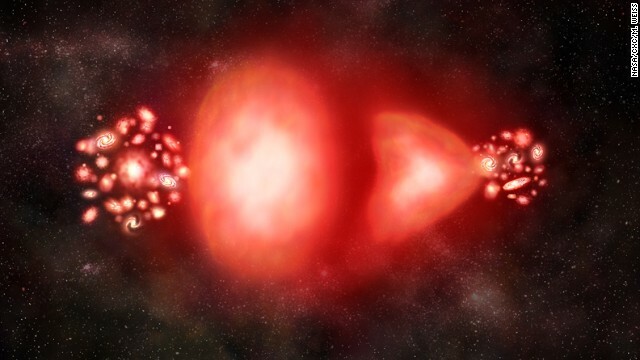 Scientists are hoping the experiment will teach them more about how the universe developed after the Big Bang. Physicists with ALPHA Collaboration research group are trying to figure out how antimatter interacts with gravity, and if it produces "antigravity," says the group's founder, Jeffrey Hangst. Their experiment mirrors the way Sir Isaac Newton came up with the law of gravity in the late 17th century. Legend has it that an apple fell off a tree and hit the English nobleman on the head. Newton got to thinking how gravity made the apple speed up as it fell. I don't know. I don't have a problem with it.